Commodification of body parts, in which kidneys are the most frequently traded, has been a new locus for the co-optation of the human body, bioethics and legal standards on organ donation and transplantation as ascribed in the biocapitalist era. Neoliberal policies operate through new constitutionalism, opening the health care system of developing countries, like the Philippines, for transplant tourism which is one of the many facets of the medical tourism industry, promising huge economic gains. This research explored how the operating notions of responsibility towards the protection of the human rights of poor kidney donors are seriously compromised by the lack of consistency in the rules governing organ donation and transplantation. 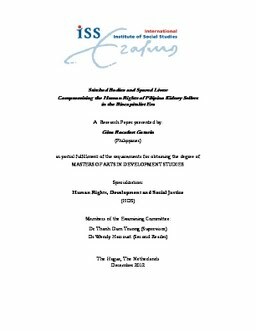 I employed biographical narrations of kidney donors from BASECO in Manila; key-informant interviews with organizations opposing organ commodification and NGOs working on different facets of poverty in this area; and textual analysis of existing Philippine laws on organ donation and transplantation to explore how poor’s bodies are treated as ‘organs’ bank for the better off’ in an era when bioscience promises longer lives through science, technology and politics for those who can afford to pay. As way forward, it attempts to expand the horizon of addressing social injustices associated with these regimes of exploitation through the collective responsibility of the range of actors involved in the organ donation and transplantation process.